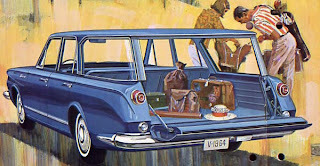 The 1964 Valiant Signet hardtop was as elegant as it was economical. Weighing in at 2,640 pounds, it cost $2,690. Valiant was the little star that twinkled brightly in Chrysler Canada’s five-star corporate lineup. The smart Euro-styled compact replaced the deleted mid-priced DeSoto brand for the 1960 selling season. Valiant shone most brightly for the Windsor, Ontario-based automaker, bringing in customers who walked out with a fine set of compact wheels. 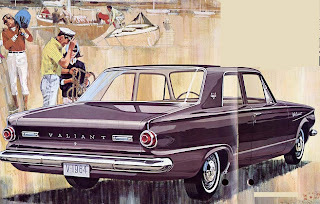 Sales of the Valiant brand rose dramatically from 16th place in its introduction year to 10th place in 1962. Nobody was more pleased than Windsor’s top brass when Valiant racked up 29,007 sales in 1963, propelling it from 10th place to fourth in calendar year sales, knocking out none other than West Germany's Volkswagen Beetle. Valiant was a marque in Canada, sold by both Plymouth and Dodge dealers. This is a first generation Valiant. From St. John’s to Victoria, folks praised their Valiants to high heavens. A Mr. Skilnik of Moncton, New Brunswick was so enamoured with his 1962 Signet he penned a letter to the company. This soldier in Her Majesty’s Royal Canadian Armed Forces had racked up an astonishing 32,000 miles (ancient Canadian units of measure) on his Valiant, accumulating much of that distance across the Dominion, with a Shasta trailer tagging along behind. He didn’t think twice about heading up over the Rockies with his trusty Chryco steed. The rugged Slant-Six was the mill of choice for the 1964 Valiant. It could be had with 101 or 225 horses. Late in the model year, a V-8 would be added. The narrow gravel road twisted and turned all the way to the 5,300-foot summit. Silnik wrote, “…the Shell 4000 Rally took the same Cascade route and five of the cars did not make it, but there was I coming through with flying colours hauling a 1,000-pound trailer by a Valiant equipped with the small 101 motor.” Skilnik pointed out that his car was quality built; that total expenses for his Valiant had thus far been only $30 for items other than regularly scheduled maintenance. 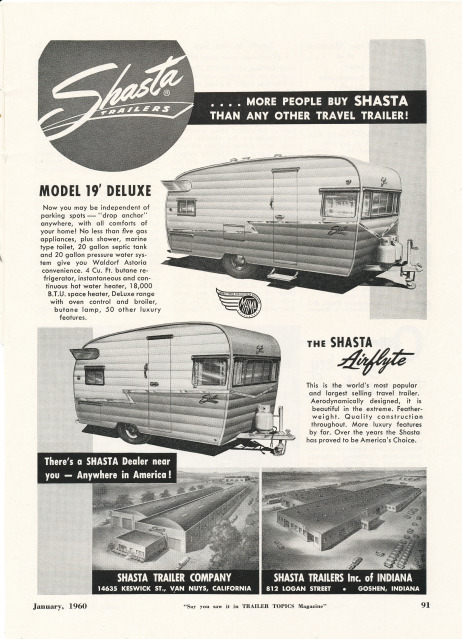 Shasta travel trailers appeared in 1941, designed for the US Army. They were popular with personnel in Her Majesty's Royal Canadian Armed Forces, too. With testimonials like that, the boys in marketing couldn’t help but be gleeful. 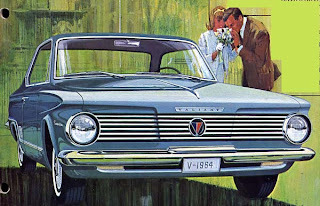 A freshly designed, second generation Valiant was ready to hit the market. This beauty would be a real contender against any and all domestic and foreign small car competitors. They would trumpet the news in every corner of the Dominion. “Valiant swings into ’64 with three great series, nine beautiful models…thrilling new styling, sparkling performance, brilliant engineering…everything to make it the value leader of the year,” was the message. Clean and uncluttered was the instrument panel of the 1964 Valiant. Round, blackface dials were highly functional and the ignition switch was illuminated. “Here, front and centre, is a great new Canadian automobile.” Described as scenically low, lively and strictly modern, the top-of-the-line Signet 200 convertible was targeted to freedom-loving, fun-loving, worldly (!) young motorists who were short on money to burn. The price tag for the open car was a hefty $3,047 f.o.b. Windsor, making it the most expensive Valiant on the showroom floor. Sharing honours with the convertible in the posh Signet 200 series was a rakish hardtop coupe that could be had with an optional vinyl roof. The smartest distance between two points was a beeline in a Valiant, and getting there never looked so good as when driving a Signet hardtop. This Valiant variant listed for $3,047. Signets could be ordered with the optional 225-cubic inch Slant Six engine that generated 144 horses. That was more than sufficient power for the pair, weighing in at 2,730 and 2,640 pounds, respectively. 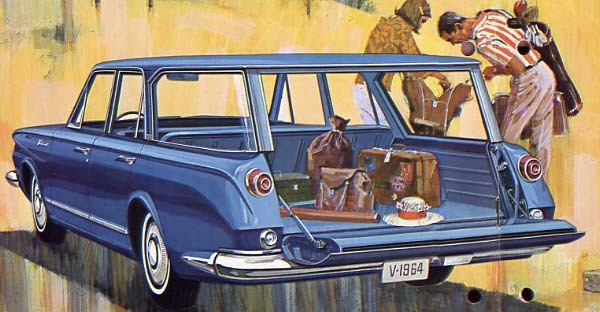 Touring the countryside was never so much fun as with the Valiant V-200 station wagon. Listing for $2,912 and weighing in at 2,730 pounds, the wagon rode on a 106-inch wheelbase. Carrying less trim and fewer niceties-but no less Valiant-was the V-200 series. Made up of a convertible, a hardtop, a wagon and a four-door sedan, this was the price range that fit the purses of most consumers. 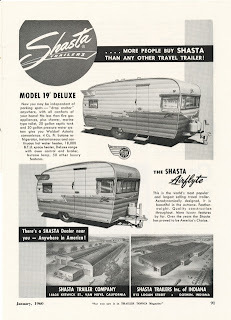 Salesmen bragged about the level stretches of roof and deck, the stunning streamlining and horizontally textured grille design before moving on to practical features like massive bumpers that counteracted over-riding and that the old-fashioned generator had given way to a modern alternator. Valiant claimed to go one better than archrival Rambler, by not only submerging its unit-built bodies in huge tanks of rustproofing, but spraying each Valiant with anti-rust spray, to boot. They went on to flog the colourful vinyl fabric upholstery that promised to keep its good looks for life and if that wasn’t enough, there was the glamour of new interior trim styles that accented the new instrument panel. 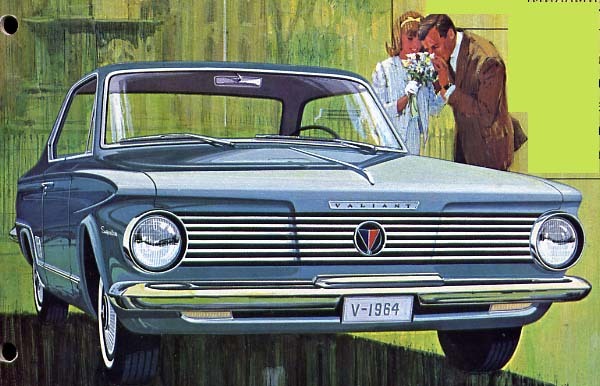 Least expensive in the 1964 Valiant lineup was the V-100 Club Coupe. The plain Jane model rode a 111-inch wheelbase and sold for $2,323. Seven out of ten vehicles leaving the Chrysler factory in Windsor wore white that year. The base V-100 series was comprised of a modestly trimmed two- and four-door sedan, along with a no-nonsense station wagon. The design was so sharp, according to the salesman, that chrome moulding and ornamentation was used only for the most sophisticated of accents. Advertising swore that everything “cliché” about styling was jettisoned in favour of a budget price—and then one would need to see the sales bill to prove it cost so little. Sitting on attractive jacquard and nylon warp upholstery, the V-100 owner was assured that he could ride in leisurely beauty knowing that his economical Valiant had cost a good $200 less than a V-200. Not just a pretty face, the V-100s made head-turning fleet cars. Italia Bar-B-Q Pizzeria and Restaurant was the largest pizza maker in Windsor, Ontario. The enterprise expanded its home delivery service considerably with the purchase of four new 1964 Valiants. The good- looking compacts may not have made pizza taste better but they certainly added prestige to the company’s image. Many value-minded business owners across the nation followed suit. Canadians got their first glimpse of the mid-year 1964 Valiant Barracuda at the National Home Show in Toronto. 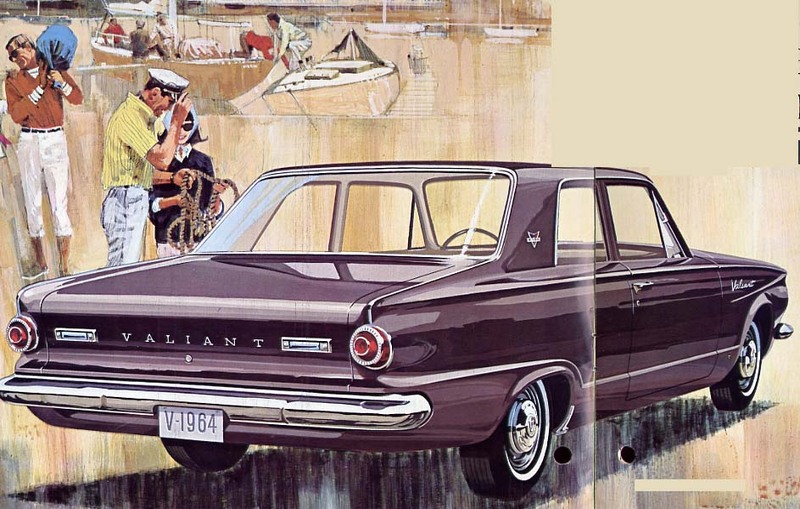 Arriving in April, a mid-year offering was a sporty Valiant model, christened Barracuda. The honours for the very first one built anywhere throughout the entire Chrysler corporation, went to the workers in Windsor. Rolling out of the doors of Plant Three, there were enough in stock for a Canada-wide May debut. 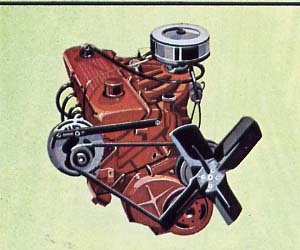 With its arrival, an extra-cost, small-block V-8 engine was made available throughout the Valiant line. 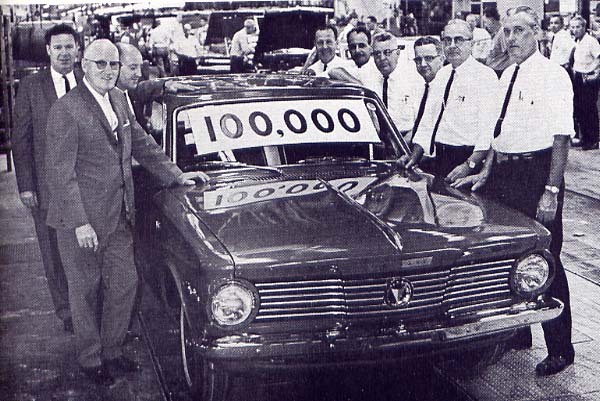 Chrysler Canada’s 100,000th vehicle to roll out the doors in 1964 was this Valiant Signet hardtop. The 100,000th car to roll out of the factory doors in Windsor during calendar 1964 just happened to be a Valiant Signet hardtop. The proud owner, one John Lewis, posed for the press behind the wheel as the folks at Midtown Motors in St. Thomas, Ontario looked on. 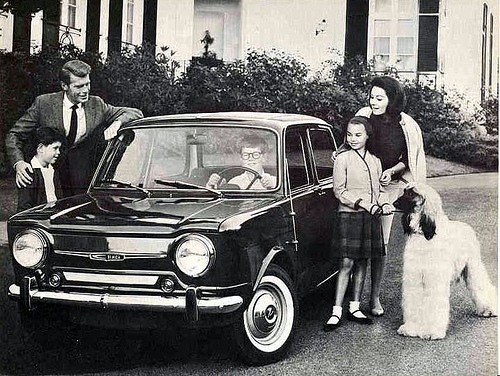 Chrysler bought 30% of Britain's Rootes Group in 1964 and offered the Hillman Imp to Canadians. Chrysler Canada marked its 40th year as an automaker during 1964. The company did very well during its Ruby Anniversary, selling 83,429 units of North American type cars and iced the celebration cake with additional sales of 707 Hilmans and 143 Simcas sourced from Chrysler France, to boot. Valiant held onto fourth place in the national sales pie for the calendar year with 34,468 units delivered. The 1964 Simca 1000 featured a rear-mounted engine.